This easy salad is inspired by one I had recently at Brown’s Social House (which I’m in love with, by the way). I had it alongside sushi and I’ve been thinking about it ever since. Most house salads are boring but theirs is loaded with good stuff; walnuts, feta and black beans. I decided to do a chopped take on it but I also added some dried cranberries, avocado and hummus dressing. This was a great “single girl” supper on wing night and I also think a double batch of it would be great at a potluck or other event. What’s your favorite salad recipe? I’m always looking for new ones! 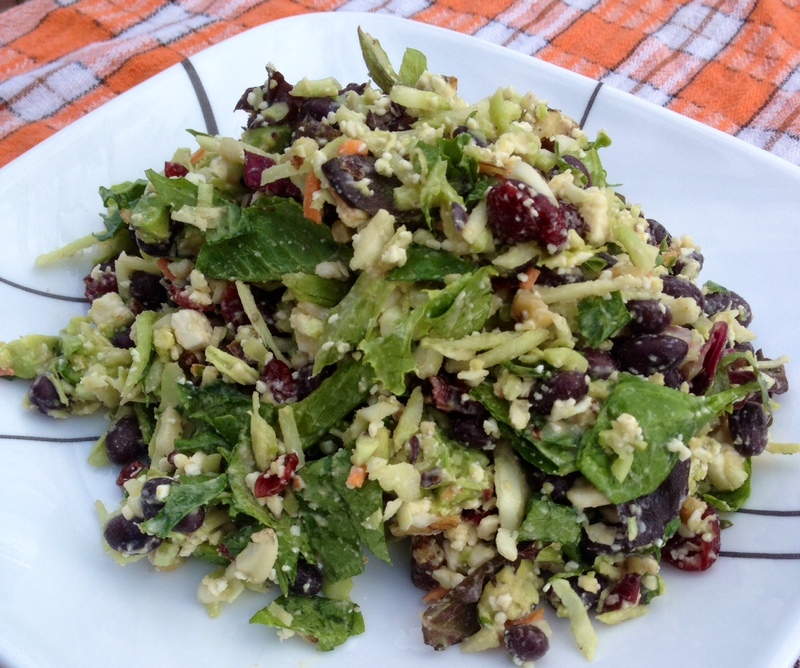 Toss together chopped salad ingredients and give everything another chop altogether. Stir together dressing ingredients and toss with the salad. I love that salad from Browns too ! I’ll have to try your version !